Let’s see if I can come up with a post every day of the rest of the offseason. Today, there are 46 days left until Opening Day on April 6.
is the number* of games Johnny Giavotella played in the Majors last season. This year,if he indeed makes the big club out of Spring Training, Giavotella will compete for playing time with Chris Getz and Yuniesky Betancourt. 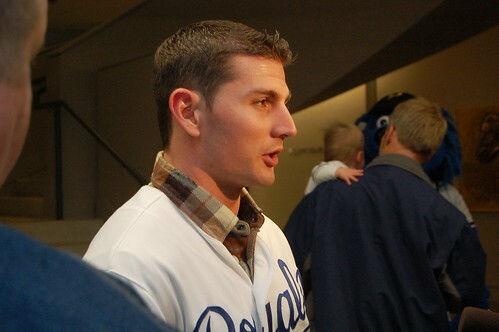 *By odd coincidence, 46 is also the number of photos of Johnny Giavotella I have on Flickr. Weird. I suppose it’s not a given that Giavotella will start the year in Kansas City. In his 46 MLB games last year, his line was .247/.273/.376 (0.0 WAR), which is not good, per se. But it’s definitely passable for a rookie 2B, and merits another shot. As a note of comparison: As a 23-year-old, Yuni batted .256/.296/.370, good for 0.5 WAR in 60 games.